This software helps you create slide shows in flash. 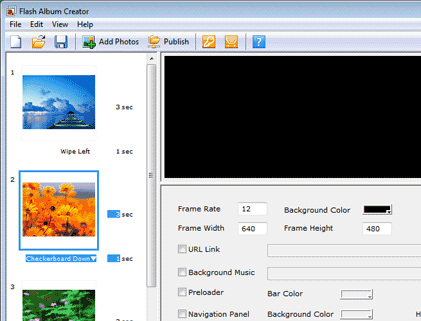 Flash Album Creator is a slide show builder in flash. Transforming a set of images into a photo slide show becomes simple with this tool. All you need to do to create a slideshow in a few minutes is to take a stack of photos, apply the transition effects , add additional text, pan/zoom animation effects, music or narration and the thing is ready! To make things easy none of this requires any programming skills. So, even if you are a total newbie, setting up a slide show for your website is not going to be a problem at all. The output options are more than one. Besides the flash movie(SWF) format, you could create EXE files of the slideshow too. This gives you the option of distributing the content on a wider scale. These can be distributed to web sites, send them by e-mails, or burn them into CDs to share with others. If you are an experienced web designer, Flash Album Creator helps with your productivity and that can help you give your clients a good turnaround time or add to your profits easily. When creating these shows you can select to add multiple lines of text for each slide, and set different font, color, size, font style and shadow effect for each line of text. Separate narrations can be added to each slide too. The interface of the Flash Album Creator makes it easy to create these shows. You can use it even when you do not have any web development experience. It will save you money too as you are not going to need the expensive flash development tools. You could use the tool to add stickiness to your site. Flash Album Creator is a powerful slide show builder. It enables you to transfer a group of pictures into your own slide show in a breeze. You can also add narration, background music, text, transition animation effects and pan/zoom animation effects as you wish. The output slide shows are in the format of Adobe Flash or EXE. You can distribute them onto web sites, send them by e-mails, or burn them into CDs to share with others. If you have no web development experience, Flash Album Creator can help you breeze through the creation of a slide show in just several minutes. What you should do is simply to add pictures and select slide properties. If you are an experienced web designer, Flash Album Creator can also be a good choice to help you make slide shows for clients to save time and effort.